You will never be confident on the road if you don’t have a reliable lug wrench because you might have to change a tire or remove lug nuts in the middle of nowhere. There are a lot of lug wrenches in the market, and you can easily buy one for your car. They, however, come in different types and qualities which might make it difficult to choose. We will look at the best lug wrenches you should go for in 2019 to help make your pick easy. The lug wrench has to have a secure grip in that it should hold the lug nut firmly in order for it to do its work. Ensure that you study the lug wrench before buying it to determine its holding capabilities. This will help you to avoid wasting your time and money purchasing a wrench with a loose grip that will end up taking up unnecessary space among your other tool collection. Because lug wrenches are used to tighten and loosen lug nuts they need to be sturdy enough to perform this task. A lug wrench made of solid steel will prevent it from breaking or bending when tightening the bolts into the wheel of any vehicle. Lug wrenches are made of steel and steel is prone to rust. A lug wrench must be constructed with chrome plated steel to prevent the wrench from rusting and wearing off. This ensures that you use your lug wrench for years on end. A good lug wrench more specifically the cross-shaped one must have a center that is strengthened. This will prevent the lug wrench from coming apart because the center could not withstand the pressure. Make sure that the lug wrench works without showing signs of coming apart at the center. No car owner would want a lug wrench that will take up all the space in his or her tool compartment. Lug wrenches should be small in size. This makes it possible for you to easily store the lug wrench a small space in your car so you can readily use it wherever you are. Tightening lug nuts should not become a nightmare to you because you keep losing grip of the lug wrench. This mainly happens when you have sweaty hands. To avoid this pick a wrench that has textured handles for quick and easy fixing of your car tires. Also, a lug wrench with a textured handle will not hurt your hand as you apply pressure on it to break loose, tight lug nuts. Pay attention to other important features that will improve your experience with the lug wrench. Look at whether the lug wrench is detachable or collapsible because you will want to store it conveniently or if it can be extended to provide for you maximum leverage. Why we like it: The lug wrench has comfortable rubber material wrapped around the handles to provide you with a good grip. It is very sturdy, and you will use it for many years, and its small size means that you can store it easily. The wrench is also very affordable, so you don’t have to dig deep into your pockets to get it. The CARTMAN universal lug wrench comes with four built-in sockets that fit lug sizes 17mm, 19mm, 21mm, and 22mm which are included. This means that the wrench can be used to fix wheels on most cars. The sockets are sturdy to withstand the pressure applied when tightening a loose nut. 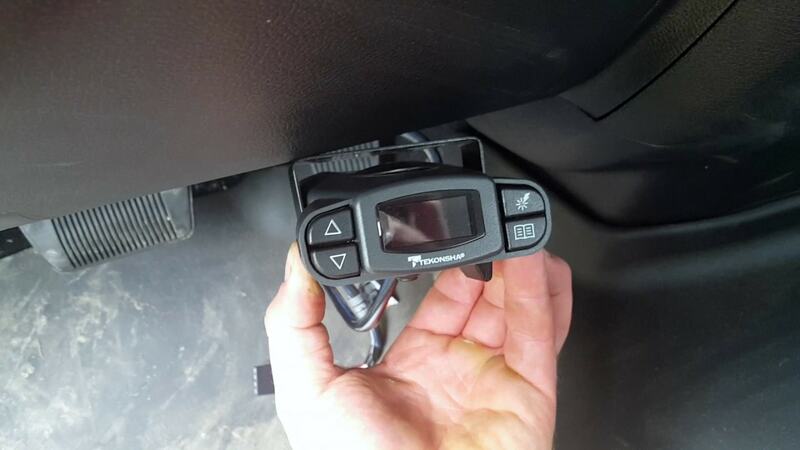 The sockets also have their respective lug sizes labeled on them to make it easy for you to identify which socket goes where and this also allows you to tend to your car quickly. The lug wrench is designed with anti-slip handles so you can comfortably use it even with sweaty hands. It features a solid structure to work on most types of vehicles. It has a reinforced center to give it extra strength to loosen even the most stubborn nuts. The lug wrench is chrome plated to prevent it from rusting or corroding. The wrench is cross style thus provides you with two-hand leverage. This means that you have twice the torque to remove and tighten lug wrenches and this also makes the wrench suitable for heavy-duty tasks. CARTMAN universal lug wrench is small in size, so it does not take up a lot of space during storage although it does require more space than the collapsible lug wrenches. You can keep it in your toolbox and use it whenever you need because it has built-in sockets. This is an excellent choice if you are willing to sacrifice a little bit of space to store it. The wrench is easy and comfortable to use, and it would be ideal for first-timers. The price is also surprisingly low for such a high-quality product. The wrench is not collapsible, thus takes much more space. It’s not a perfect size for big vans. You will need a larger size. Why we like it: This is your go-to wrench if you need a quick fix for your car and it is built to work on stubborn nuts. The wrench comes with several sockets so you can use it on different types of lug nuts. It is reasonably priced meaning anyone can afford it and it is super easy to use. The wrench comes with two double-sided sockets measuring 17mm/19mm for the smaller socket and 21mm/23mm for the larger socket. This allows the sockets to fit universal lug nuts. The sockets are made of chrome-vanadium steel to make them strong and durable. You can also purchase other brands of sockets for other lug nuts which may not fit the included ones. 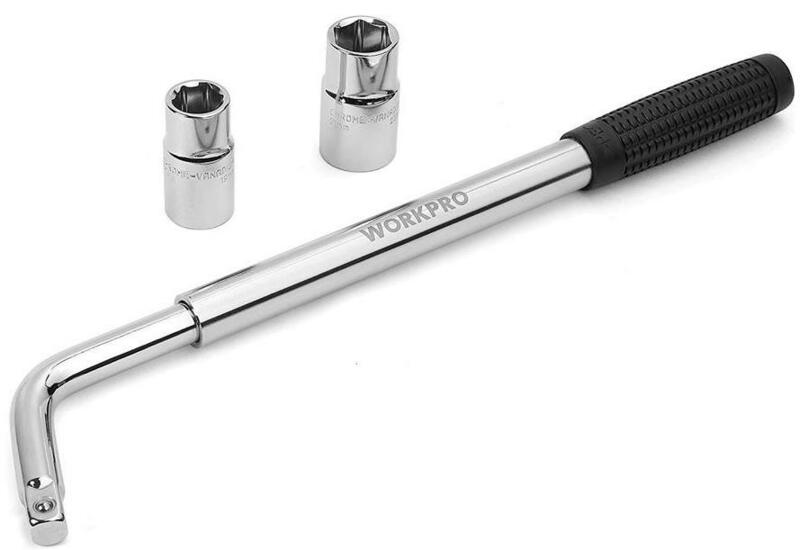 Like any other good quality lug wrench, the WORKPRO telescoping wrench is built to last. It features a drop forged carbon steel for strength and durability. The steel is chrome plated to prevent it from rusting and corroding. The telescoping feature of the wrench allows you to increase its length to provide you with more leverage when loosening stubborn nuts. The handle of the wrench is textured to ensure that you have a firm grip when loosening tight nuts and to also prevent your hands from becoming sore due to too much pressure. The lug wrench takes up very little space during storage. The telescoping handle means that you can shorten it. It does not come with a carrier bag or pouch so you might need one to avoid losing the sockets. It will also fit comfortably in a small toolbox, or you can find a small space in your car to keep it so you can easily access it in case of an emergency. The sturdy construction of this wrench makes it a perfect replacement to your larger and heavier lug wrenches. The wrench is affordably priced but it is such a sturdy and efficient tool, and you will definitely be pleased with its torque and ease of use. It does not come with a storage pouch, and you might lose the sockets. Why we like it: The lug wrench comes with a socket extension to allow you to reach nuts that are placed deeper in the wheel. The wrench is designed to fit easily in a toolbox or a small space in your car making it a convenient and reliable tool. It is universal and features sockets of different sizes to fit different sizes of lug nuts. 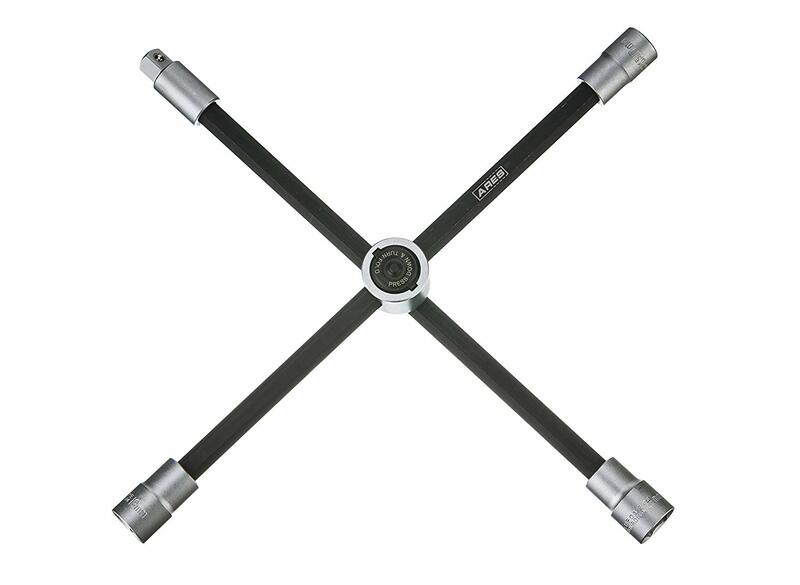 The lug wrench has a dual socket design and the sockets come in different sizes meaning that they can be used on almost all kinds of vehicles. The sockets measure 7/8” (22mm) and 13/16” (21mm) for the large socket and 3/4” (19mm) and 11/16” (17mm) for the small socket. The sockets store in the handle so you can use them whenever you need. The wrench has a patent-pending design; hence it works like an L-shaped lug wrench to loosen stubborn nuts. The drive head is movable to provide you with all the leverage you need, and you can slide it to the center or toward one end to quickly remove or tighten loose lug nuts. The lug wrench is sturdily built to make it durable and take down the tightest lug nut without a hassle. The shaft is chrome plated to prevent it from rusting or corroding when exposed to the weather. The lug wrench takes up very little space during storage. This is because the sockets and extension can be stored in the handles of the wrench. You can take it with you anywhere because you can easily keep it anywhere without losing any of the accessories. This is an excellent pick for people who have previously had trouble with other lug wrenches as it is super easy to use and reliable during emergency situations. It has solid construction, and you do not have to worry loosening the most stubborn nuts. The end caps are made of plastic; hence they may not last long. Why we like it: The lug wrench is compact, and it comes in handy during an emergency. It comes with a carrying pouch so you can access and use it whenever you need. The handle is extendable to provide you with extra leverage. The lug wrench comes with two double-sided sockets which measure 3/4”, 13/16”, and 7/8” to fit most lug nuts in most types of cars, but you can always spend a little money to buy more sockets to fit your lug nuts. The sockets are, so you can use it to fit lug nuts that are placed in tight places. The wrench is L-shaped, and it is made of solid steel, and it will, therefore, last a long time when used occasionally. It features a telescoping shaft which extends to almost twice its length to provide extra leverage. The lug wrench is designed to lock into place when fully extended, and this helps it remain firm when tightening or loosening a lug nut and you can easily switch from long to short wrench without having to stop in between to adjust its length. The wrench has a rubber handle which provides you with a firm grip while at the same time preventing you from hurting your hands. Every car owner wants a tool that can be stored easily in minimal space and this lug wrench does just that. It is collapsible and comes with a plastic pouch which you can use to store the wrench together with the sockets. You can also just throw it in the toolbox. This lug wrench is a cheaper option for those who want an extra wrench for emergency situations. This also means that the quality may not be as good as the more expensive lug wrenches but it is excellent for occasional use, and it does what it is supposed to. Why we like it: This is a sturdy lug wrench that is easy to use and takes very little space to store. 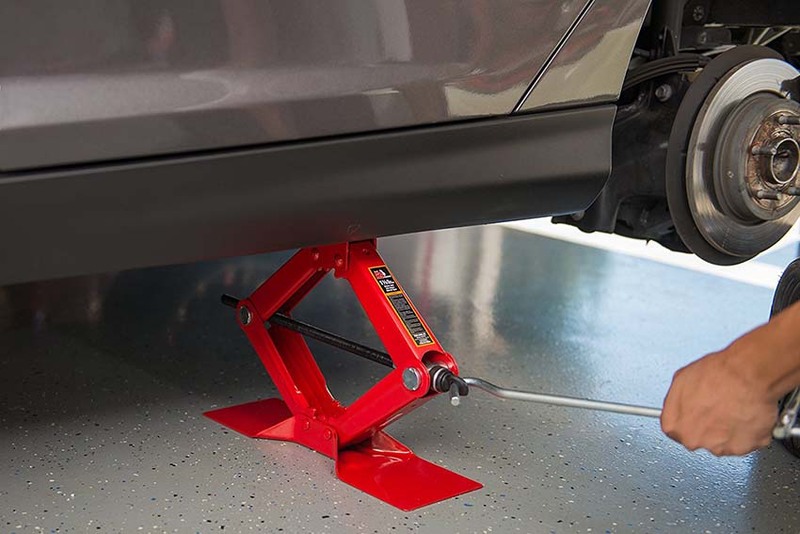 It has an impressive design and the parts easily snap together when you want to use it, and you can adjust to the L-shape to get extra leverage when loosening stubborn lug nuts. 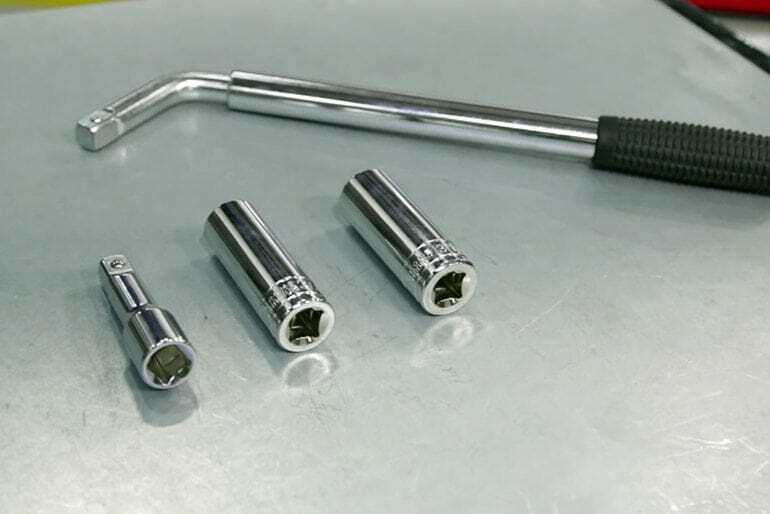 The lug wrench features built-in 21mm, 19mm and 17mm sockets which will fit the most common lug nuts. It also includes an adapter for attaching all of the other individual sockets that you will need for different types of nuts. The walls of the sockets are thin to work on nuts in tight places. All good lug wrenches are sturdy, and this wrench has an ultra-strong solid steel construction to allow it to perform heavy duty tasks and also to make it durable. It features a power mode and speed mode to make it more efficient. The L configuration provides you with more torque so you can loosen stubborn nuts and the speed mode allows you to remove the bolts quickly. The lug wrench is easy to assemble so you can use it wherever and whenever you have encountered problems with your tire(s). The solid steel is resistant to rust and corrosion even when exposed to harsh weather. You can easily disassemble the lug wrench after use and store all the parts as one to reduce the space it takes. It comes with a compact carrying bag for storing the wrench to ensure that you do not lose any of the parts. The bag also allows you to store it almost anywhere making it ideal for people who own small cars and single cabin trucks. If you love quality, then this is the best pick for you. 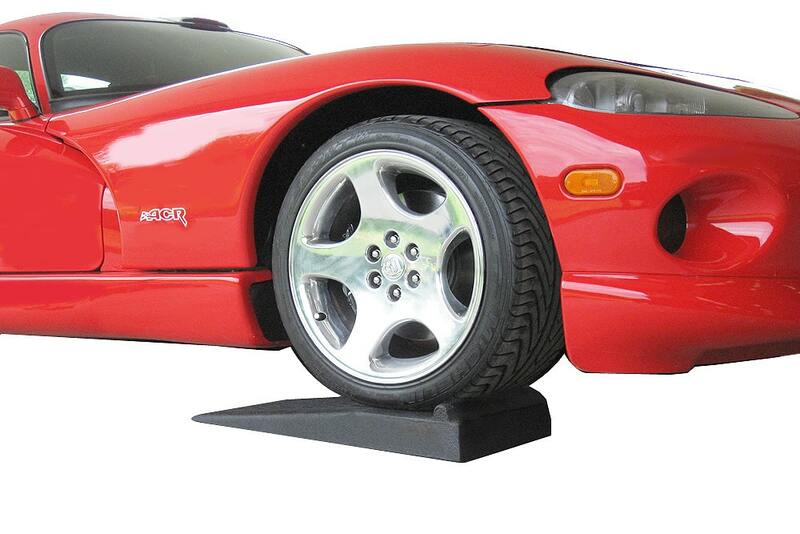 It is sturdy and durable and will see you use it throughout your life as a car owner. The ease of use means that anyone can use it; thus it is ideal for people who don’t have a lot of experience with lug wrenches. The ball bearings are not as tight as they are required and this may eventually lead to problems. Why we like it: The wrench is adjustable and with solid construction to last long. It is just the right size, and it provides you with a good grip, so you don’t hurt your hands when tightening nuts or loosening the tightest ones. 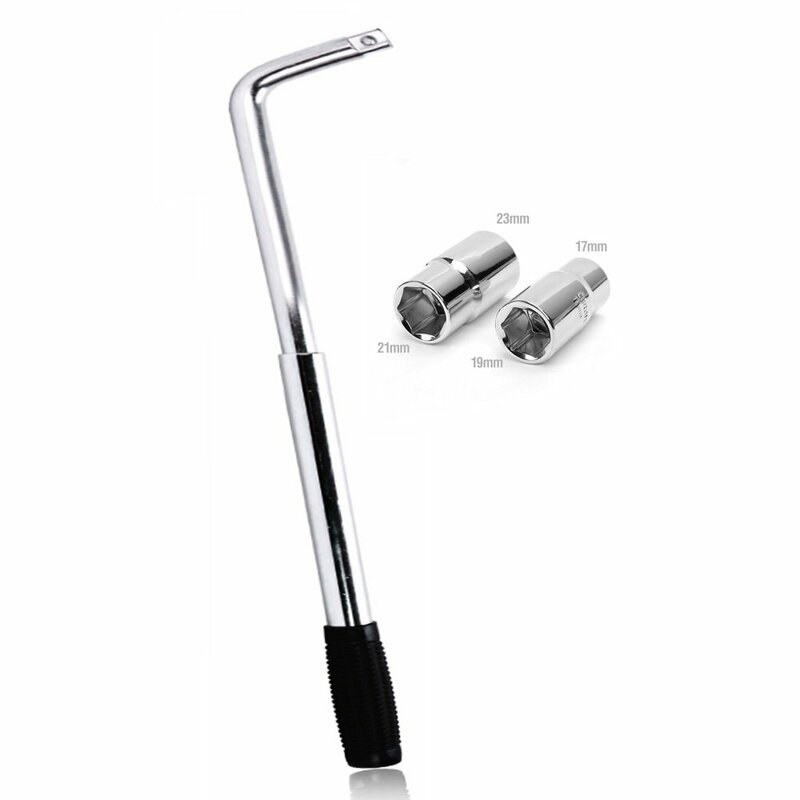 The wrench is also very easy to use even for those who have never used a lug wrench before. The wrench comes with two double-sided sockets which measure 21mm/23mm for the large socket and 17mm/19mm for the smaller socket. This makes it suitable for most wheels with standard sized nuts. The sockets are sturdy, and they are non-slip, and thus they hold the nuts firmly to allow you to quickly and easily change your car wheel. 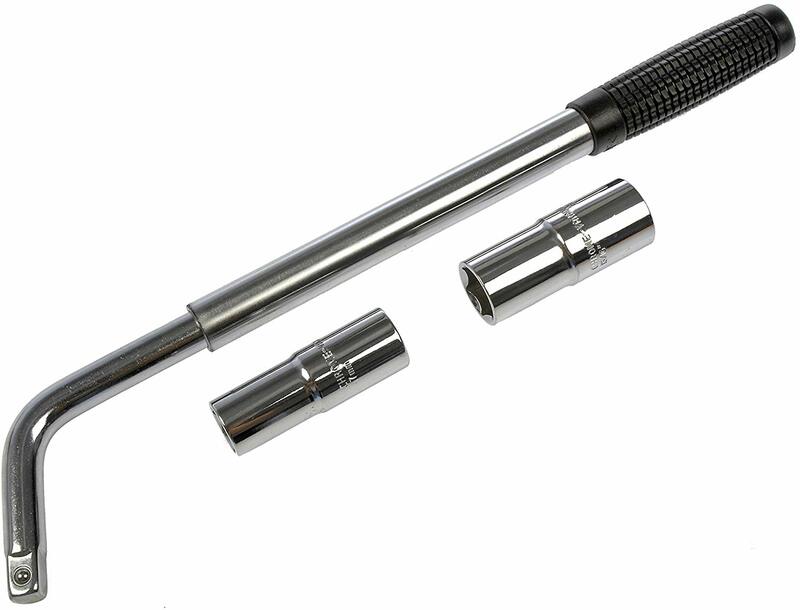 YITAMOTOR Standard Telescoping Lug Wrench is built to last with industrial quality chrome vanadium steel. It features an extendable handle that locks into place to provide more torque when removing stubborn nuts. The steel is resistant to rust, and the handle is made of rubber to provide you with a good grip and prevent your hand from becoming sore. The telescoping feature means that it can be shortened and this will consume a little less space. The wrench does not come with a case so you will need to find something to store it in such as a toolbox or a pouch. Either way, you do not have to worry about moving your things to create space for your new lug wrench. We are positive that you will not be disappointed by this tool. It is not often that you get a good quality wrench at a very affordable price. It comes in handy during emergencies and the sockets included will make sure that you fix your car wheel without any trouble. 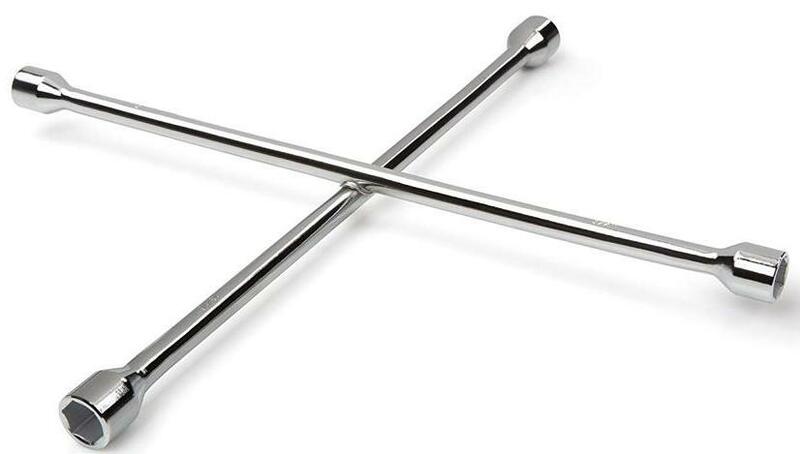 Why we like it: This lug wrench has a cross design which provides extra leverage. It holds the lug nuts firmly, and you can rely on it whenever you need to change a flat tire whether in the garage or on the road. We also like that the wrench is of good quality yet the price is affordable. The wrench comes with four built-in sockets for lug nuts of different sizes. They measure 3/4″, 13/16”, 7/8”, and 19 mm. The walls of the sockets are thin to allow them to work on nuts that are in tight spaces. Each socket has its size stamped on it to allow you to quickly identify which socket goes where thus making your work easier. When it comes to quality TEKTON 5975 does exceptionally well. The cross-style design provides you with two-handed leverage to loosen stubborn nuts and easily remove nuts by spinning the wrench to save you time. The wrench is built sturdily to perform heavy duty tasks at your garage or on the road. The handles are long to reach nuts in deeply dished wheels. The lug wrench features a chrome finish to make it resistant to rust and corrosion. The center of the wrench is also strong to prevent it from breaking when working on stubborn nuts. It has a smooth finish to allow it to spin in your hands when removing the nuts freely. The wrench is cross-shaped, and therefore it will take up more storage than the telescoping wrenches. However, it will not consume a lot of space than your other big car tools, and you can keep it in the trunk of your car or place in a toolbox for convenience. 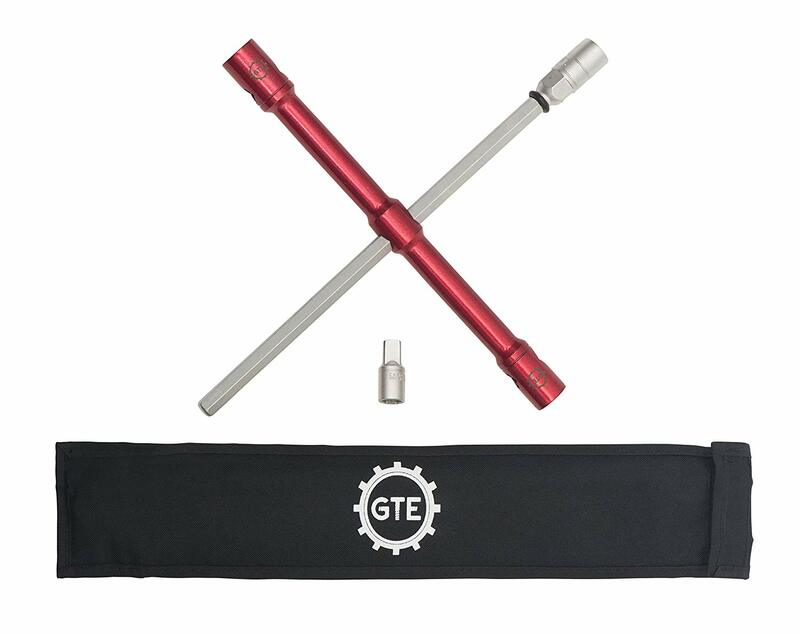 Although the wrench is non-adjustable, we are sure that you won’t mind having it in the trunk of your car because this is the lug wrench that you need. You will be able to quickly fix your car tires or even help a stranded person with it because it is highly efficient and reliable. Thin-walled sockets to work on nuts in tight spaces. The wrench is not collapsible. Why we like it: The Performance Tool lug wrench is foldable to allow you to store it conveniently without taking up much space. It allows you to work on lug nuts quickly and easily meaning it is ideal to take it with you wherever you go. It is also priced very cheaply. The performance tool comes with four built-in sockets to use on different lug nuts. The sockets measure 17mm, 19mm, 21mm, and 23mm and they will fit most standard lug nuts. Each socket handle has the individual size marked on it both in metric and SAE measurements. The sockets are thinly walled to work on nuts in tight spaces but sturdy to prevent them from ripping apart when subjected to pressure. The lug wrench is designed to be folded when not in use, and it is well made so it will not feel flimsy in your hands despite the foldable feature. 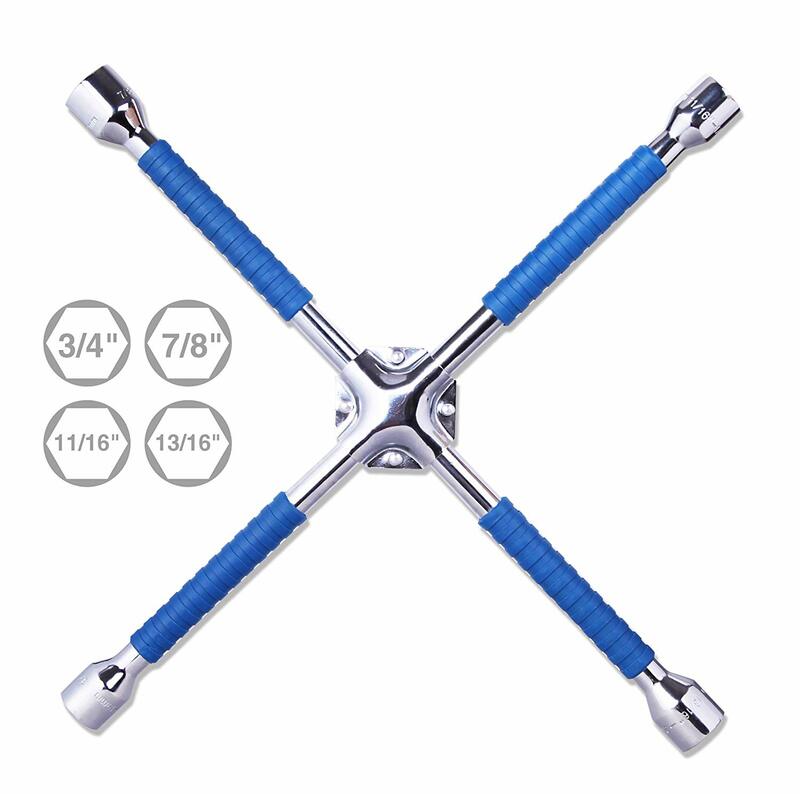 The handles are long to provide you with extra leverage when breaking loose stubborn nuts. It is made from heavy-duty forged steel, and it features a chrome plated finish to prevent it from rusting or wearing out due to corrosion. The handles of the wrench have a smooth finish to allow you to spin it with ease, but they also provide a firm grip when you need to tighten or loosen a nut. This makes it possible for you to fix your car within a short time. When it comes to storage, this lug wrench beats the rest. It can be folded down to take up minimum space during storage. It should be your top choice if you own a small car, have a lot of tools or simply love to travel with small and light tools. The built-n sockets also mean that you will not lose any of the parts during storage for a long period! While we cannot assure you of its quality, we can definitely tell you that this lug wrench is a handy tool that will save you during an emergency. The quality of the wrench is worth the price, and it is ideal for occasional use. The quality is not the best. Why we like it: This 4-way lug wrench has an adjustable sliding design for leverage, and it is collapsible for storage. It is universal and can be used to fix most types of vehicles. In addition, the wrench is super easy to operate to ensure that you fix your vehicle without a hassle. The ARES 70092 comes with three common socket sizes and a ½ inch socket adapter. The sockets measure 17mm, 19mm, and 21mm while the adapter allows you to attach your favorite socket for other sizes of lug nuts. They are thinly walled to fix nuts that are placed in tight spaces making it reliable whenever you are experiencing car trouble. If we were to grade lug wrenches in terms of construction, then this lug wrench would get a 10/10 because it is created with the user’s best interest in mind. It features adjustable sliding handles which slide on all four directions to provide you with twice the leverage when loosening tight or stubborn nuts. It has a push button at the center to collapse the lug wrench when not in use. The lug wrench is high quality, and it is made of heat treated Chrome Vanadium steel which prevents it from rusting or corroding. The steel is sturdy, so you don’t have to worry that the wrench will bend or break while working on tight nuts. It is not easy to find a lug wrench that can adjust to the size you want but also collapse to a considerably small size for storage. This lug wrench, however, was designed with storage in mind. It can collapse to the perfect size for storage, and you can be assured that it will take up very little space in your vehicle. This feature makes the wrench perfect for small cars. You will never be disappointed with this tool. It has impressive features to make your life as a car owner easy and manageable. The quality of the wrench also means that you’re going to use it for a long time and still have it in excellent condition. The shape of the handles might make it difficult for some people to use the wrench comfortably. Why we like it: The design and appearance of this lug wrench are very attractive to any car enthusiast. It is made of strong and durable material to last you a lifetime. It works great on almost all kinds of lug nuts as well as all types of vehicles. 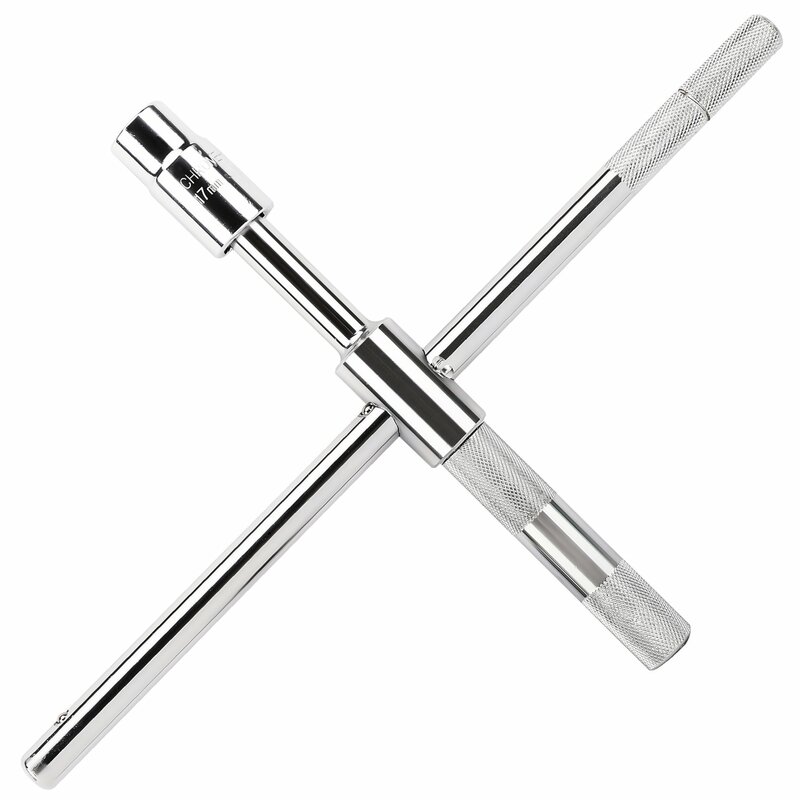 The wrench comes with two double-sided sockets that fit the most popular lug nuts. The sockets measure 17/19mm and 21/23mm. They are made of chrome vanadium steel to make them resistant to rust and corrosion and also prevent them from breaking when they get subjected to a lot of pressure. The sockets have thin walls to work on nuts that are in tight spaces thus making the wrench convenient and reliable wherever you are. This is another wrench that highly excels in its construction. It is made of chrome-plated steel to make it durable and prevent it from rusting. The general construction of the wrench is solid to prevent it from breaking or bending even when working on the toughest of lug nuts. It has rugged handles to provide a firm grip when breaking loose nuts. The MoKo universal wrench has a cross design to provide you with two-handed leverage to work on stubborn nuts. It features a free spinning handle to allow you to quickly remove the nuts or put them back on the wheels and a polished finish to enable you to clean it quickly and easily. The wrench is detachable, and you can easily take it apart when you want to store it. This reduces the size of the wrench meaning that it will take up very little space during storage and therefore you can take it with you wherever you go. This wrench will make you long for another flat tire so that you can use it again! It takes up very little space, and this would be every small car owner’s best friend. The lug wrench, however, does not come with a storage case so you might need to get one but that is a low price to pay for this mighty tool. Not all lug wrenches work on all vehicles, so you need to consider the type of vehicle that you own. Lug wrenches come in different sizes depending on how they will be used. For a car or a small truck you can go for a small wrench, but if you own a heavy vehicle, then you might need to get a heavy duty lug wrench. You should also consider the type and size of lug nuts that your vehicle has. A wrench might have sockets for standard nuts, but yours may have a different type of nuts. You can however easily purchase a socket that will work for your vehicle. When do you want to use it? Accidents and car failures are not always planned, but you should always have a lug wrench with you in case you encounter one of these. It is good to have a lug wrench that you can take it with you everywhere you go without actually feeling like you are carrying a load. The ideal wrench in this situation is one that is adjustable or collapsible because you want to save on space. In addition, you may need to change a flat tire at home because you always check your car tires for any problems before heading out. For this case, you might use an ordinary lug wrench, one that you can leave in the garage after using it. Sometimes a lug wrench might fail to do its work because it was not designed for your car or truck wheels. Most of the time it is because car owners do not check first if their wheels are deep dished or if the nuts tightly squeezed in them. Each of these instances requires lug wrenches with long handles or with thin walled sockets respectively. Lug wrenches are designed differently by different manufacturers, and therefore some are easy to use while others are more difficult. People who are not used to fixing tires by themselves may need to go for the easy to use lug wrenches. Experienced people, on the other hand, may have no problem with using the more difficult lug wrenches since they already know how these tools work. You should not just go for a lug wrench because it is cheap. What if it is that way because the quality is poor? Most lug wrenches are cheaply priced because they can only handle light tasks. Instead, you need to be sure that the wrench can do what you want it to do before you purchase it so that you don’t regret your choices later. Some lug wrenches are designed for occasional use and may get ruined if used too frequently. Try to avoid these lug wrenches if you can but also remember that they may come in handy when you are in an emergency. If you really have to buy them to avoid overusing them but also keep them close to you because you will need it at some point. Where shall you keep it? Depending on the size and type of the lug wrench you will need to consider how you are going to store it. Some come with their storage pouches, and some don’t, and you will need to figure out where you are going to keep it. Remember that you can always improvise a carrier bag for wrenches that do not have one and you don’t need to spend extra cash purchasing it for your wrench. As much as we recommend that you go for high-quality lug wrenches you also need to consider the amount of money that you can afford. While most wrenches that are cheap are not good quality, you will find some that are surprisingly sturdy. Ensure that you have taken enough time to look into them to determine which one is the best cheap lug wrench. Loosening lug nuts can be a tough task but with the best lug wrench you will even enjoy doing it. However, ensure that you are buying a perfect match for your vehicle and it should be easy to use and also store. Again, go for a lug wrench with useful features such as a comfortable grip especially the padded ones and with great torque. Whatever road you take do not forget that you will always need a lug wrench. We have provided you with the ten best lug wrenches for 2019, and now you can easily pick one that you believe is the best for you.